Before I share my thoughts, let me just say that I LOVE competition and competing. It’s fun and energizing for me. So I honestly don’t think that “competition” in and of itself is a bad thing. Not at all. I’ve had many parents of young children ask about the “harms” of competition and is it a bad thing or is it really necessary? I don’t think it’s bad or “necessary,” but it sure is fun when you have a quality mindset about it. How you view competition and how you move through it and perceive things because of it, can be more positive or more negative based upon your perspective and how you choose to respond to what happens. 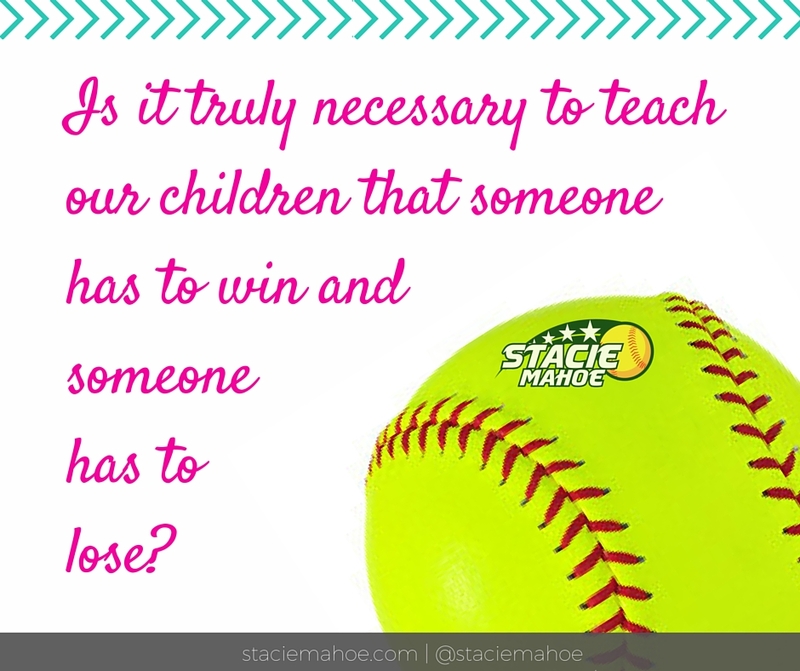 Is it really so important for us to teach kids that there are “winners” and “losers?” Or to promote the idea that someone has to win and someone has to lose. Because, what I’m finding out about life is, I’m not really in competition with anyone else. Just because I have a husband and a house and a family and a business, doesn’t mean you can’t too. We can both have beautiful and wonderful, “successful” lives. Even in business, a while back when I started All About Fastpitch, one thing I heard all the time from people was that there were 3 websites they visited often: Marc Dagenais’ Softball Performance, Cindy Bristow’s Softball Excellence, and All About Fastpitch. Even though we’re all online and all in the fastpitch softball space, we really aren’t competing “against” one another. Each of us has something unique as special to offer that the others don’t. People didn’t STOP visiting the other sites because they visiting mine, nor vice versa. Most people were making use of all 3 because all 3 filled a different need or want for them. A decade later, Marc, Cindy, and I are ALL still online serving the fastpitch softball community AND many more have joined us over the past 5 years or so! None of us had to “lose” because the others existed or did well. So, is it really necessary to move our kids so far away from the “everyone is a winner” or “everyone can be a winner” mentality? Is it even helpful to teach them then someone has to win and someone has to lose? Or are we setting them up for feelings of failure or frustration or depression when they see that other people have something and they don’t have? Will they always look at the world through the lens of “competition” and assume that, because they haven’t “gotten there” yet, and someone else has, that that person must be the winner and they must be the “loser?” If someone else has the car, the job, the house, the spouse, the family that they haven’t yet found, that that person is a winner and, by default, they are a loser? Do we really help our children by perpetuating that competition/comparison/winner/loser perspective?